(Pictured Above) Cheyenne, one of two arctic wolf hybrids at the Zoo, greets Nathan Bazinet, Interim Executive Director, during a recent visit. Hopefully you are enjoying this snowy New England day, tucked away safely in the warmth of your home. I am reaching out to provide introductions and share some news and updates from the Zoo in Forest Park and Education Center. If we have yet to meet, my name is Nathan Bazinet and I have had the honor of serving as the Interim Executive Director since October 2016. My connection to the Zoo is simple, and likely similar to yours. Born and raised in Western Mass, I visited the Zoo often as a child - day trips with my mom to listen to speakers, attending friends birthday parties, and feeding the goats with my grandparents. So many incredible memories that I will cherish for a lifetime. I am grateful for the ability to volunteer both my time and experience to this wonderful organization for the 2017 season. As well, I know how important the Zoo is to this community - throughout 2016, we educated and engaged more than 44,000 children and families. You have the greatest impact. Without a strong, supportive community of individuals, like you, we would not be able to provide these educational, fun, and engaging opportunities for thousands of children and families every year. When you purchase a ticket for admission, make a donation, or join as a member, you offset the cost of animal food, veterinary care, enclosure upgrades, and provide enrichment activities. Your support is critical, and greatly appreciated. Thank you! This is your Zoo. I encourage you to reach out to me or any member of our leadership team with feedback, questions, or suggestions for how we can improve your overall experience. You can reach us directly by clicking on our names below. I look forward to communicating with you regularly with this e-newsletter; providing updates on new initiatives, activities, and exciting happenings. Thank you for supporting your local, independent, non-profit Zoo! Carol Levine was surprised and elated to receive a heartfelt and thoughtful gift from her family this holiday season: the gift of generosity. 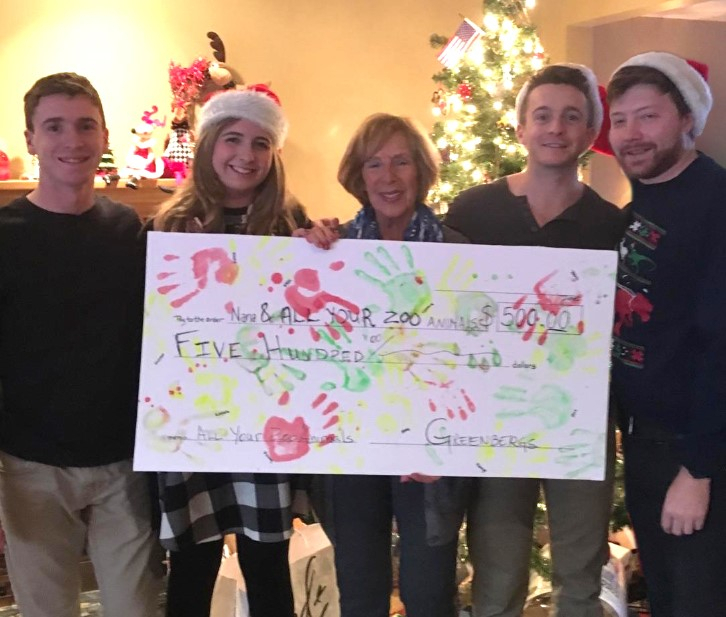 Carol’s grandchildren pooled their holiday funds and surprised her with a check for $500 in support of the Zoo in Forest Park and Education Center, where Carol is a longtime volunteer and supporter. Zoo Camp is a fully immersive education program held by The Zoo in Forest Park and Education Center to provide children ages 7-13 with the chance to sharpen social and critical thinking skills through interaction with native and exotic wildlife in a beautiful outdoor setting. Zoo Camp attendees learn about animal care, nutrition, conservation efforts, and environmental responsibility in unique ways not normally available in everyday life. In 2016 our Zoo Camp helped more than 250 attendees experience the stunning beauty of the animal kingdom, and continues to be a huge hit at The Zoo in Forest Park and Education Center. Contact Ben Stafford at education@forestparkzoo.com or (413) 733-2251 to learn more or sign up today! (Pictured Above) Nathan, Kate, and Amanda unload produce for animal diets generously donated by Big Y. Throughout 2016, Big Y generously donated over $12,000 worth of fruits and vegetables in-kind to help feed our over 150 animal residents. THANK YOU! We are actively building our front line volunteer program with opportunities in the Gift Shop, Ticket Booth, and Guest Relations. Contact Amanda Bligh at amanda@forestparkzoo.com or (413) 733-2251 to learn about available volunteer roles for the 2017 season.